Who doesn’t love a good laugh and an excuse to eat a (healthy) sweet treat? We at Health sure do, which is why we’re so excited about the season four premiere of Arrested Development. 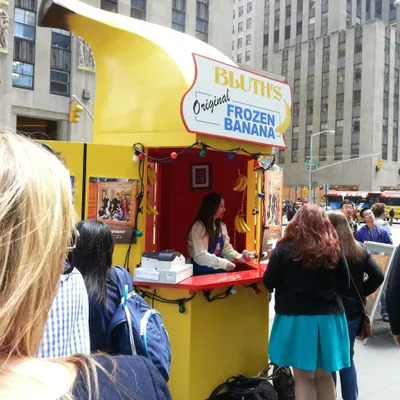 The critically acclaimed and cult favorite sitcom returns after a seven year hiatus on May 26th, and in anticipation of the show’s season premiere, Bluth Banana Stands are popping up in London, New York City, and Los Angeles. A few of us stopped by the banana stand outside of Radio City Music Hall and indulged in the chocolaty, cool snack, but if there isn’t a Bluth Banana Stand in your area, you can make these yummy chocolate banana bites. They’re an easy sweet treat made up of four superfoods, and at less than 150 calories per serving, they’re a snack you can feel good about. Plus these bites will fill you up and help speed up your metabolism because of banana’s healthy carbs.